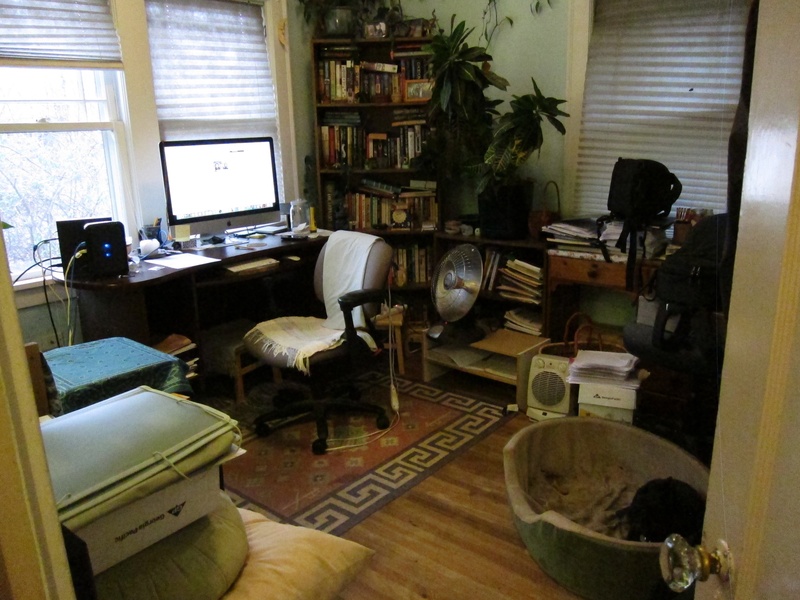 It took almost a week of sorting through drawers and heaped-up piles of junk and shredding reams of papers. When I started, it looked like this. Here’s the same room today. Amidst the clutter, I found this “Groovy Girl,” Natalie. As a child, my granddaughter Bridghid used to collect Groovy Girls. I bought one for her and couldn’t resist buying this one for myself because she reminded me of the writer, Natalie Goldberg, who wrote some cool books about combining writing with Zen practice. I dedicated a couple of shelves to my two favorite authors, Charles de Lint and Margaret Atwood. Both have overflowed their allotted space, but, oh well. So… will ideas flow more freely in an uncluttered space? I keep reading that this is the case, and I already have new ideas for ratcheting up the conflict in my latest first draft. 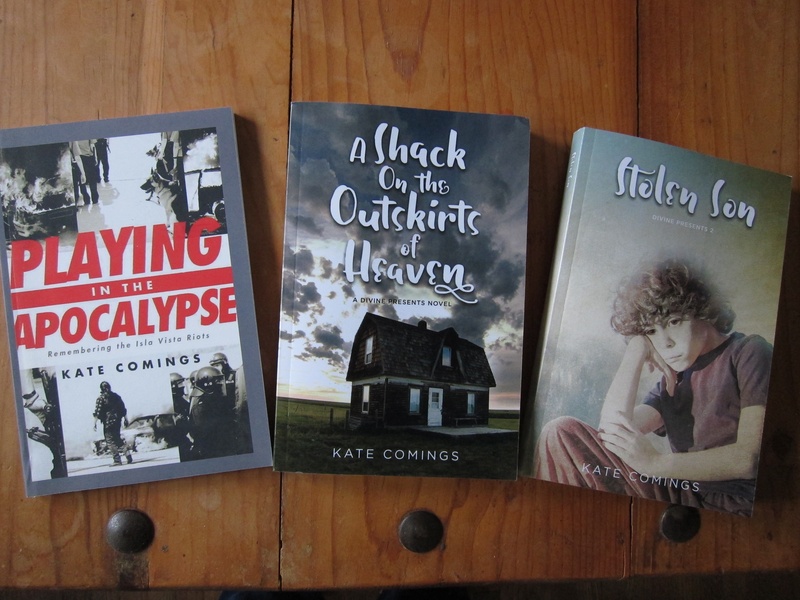 Tags: Books, Cleaning, Decluttering, Tidying, Writing, Writing process | Permalink. I have way too much stuff. How I manage to work, or even think in here, I have no idea. So, I’m gonna clean it up, and I’ll post again when the job is done. It’s the perfect time to do it: wintry weather makes it tempting to stay inside, and I just finished the first round of revisions to my next novel. Now I need to take a break and let it sit for a while so I can see it with fresh eyes when it’s time for the next rewrite. I have been writing and revising for a long time. That was my focus instead of tidying, and I let everything pile up. In stacks, and more stacks. 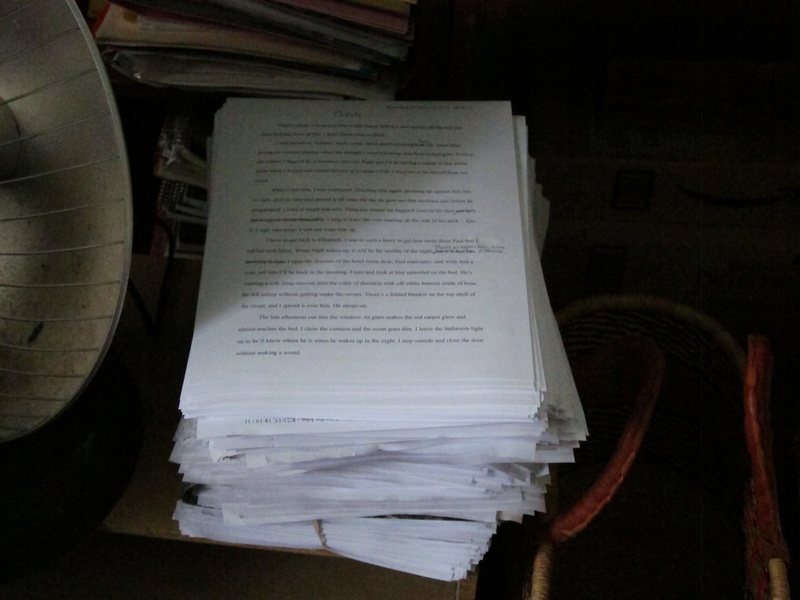 This is a stack of printed-out, revised manuscripts of my three books now in print. They need to be shredded and recycled. They represent years of work, and I’m sort of attached to them, and shredding takes a long time. The rubber bands holding each version rotted while I procrastinated, and I finally got started. I had actually shredded a bunch before I took the photo. It wasn’t as hard as I thought; having the books in front of me reminded me that these stacks were only the means to an end and it’s time to say goodbye. Saying goodbye to some of the books on my overloaded bookshelves is going to be a lot harder. Tags: Books, Cleaning, Clutter, Decluttering, Editing, junk, Mess, Revisions, Tidying, Writing | Permalink.